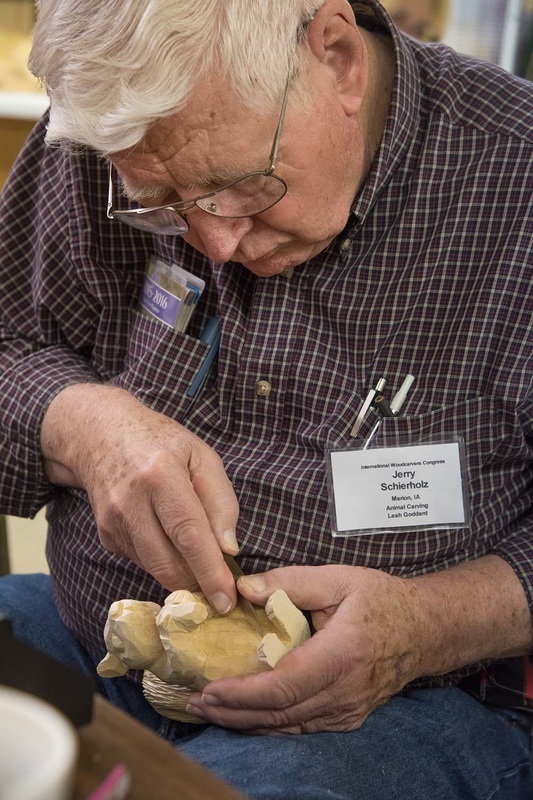 International Woodcarves Congress 2015 Classes - Don Mertz, The ABCÕs of Face Carving With a Knife. Don and Francis line up a class photo. 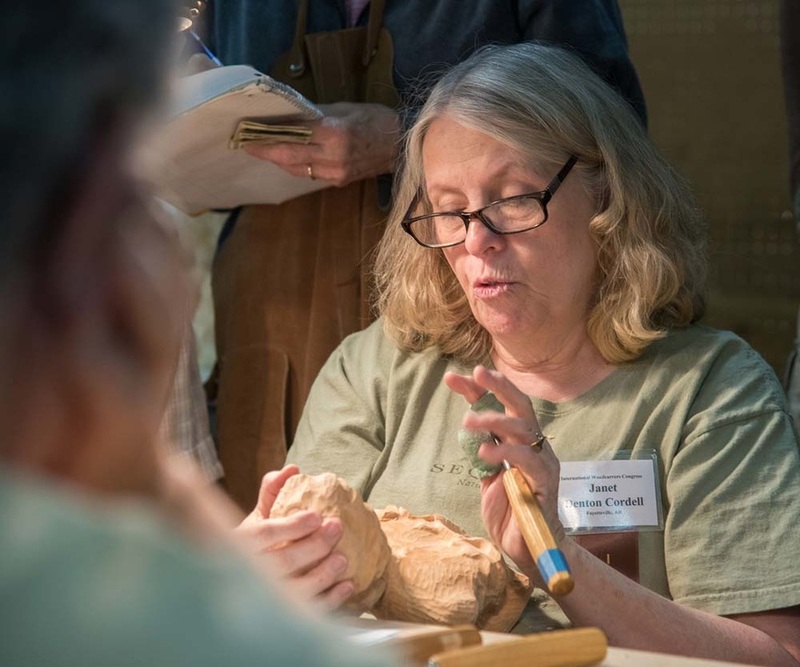 International Woodcarves Congress 2015 Classes - Janet Denton Cordell, Carving a Female Face. 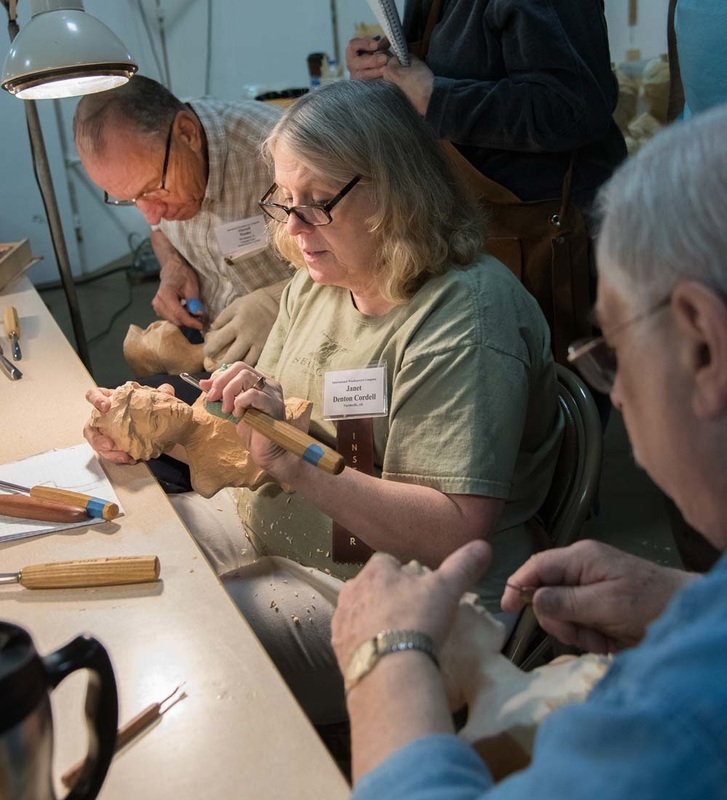 International Woodcarves Congress 2015 Classes - Janet Denton Cordell, Carving a Female Face. 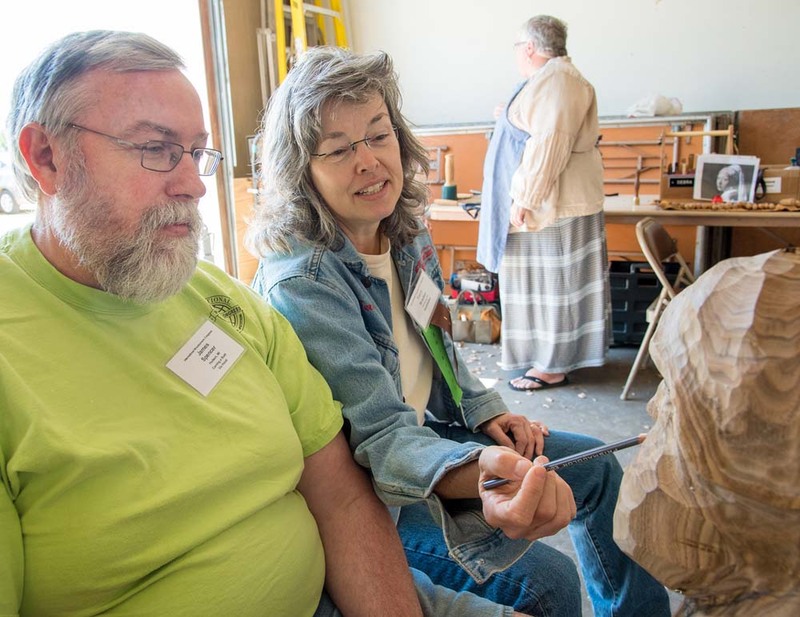 Janet with Darrell Rader looking on. 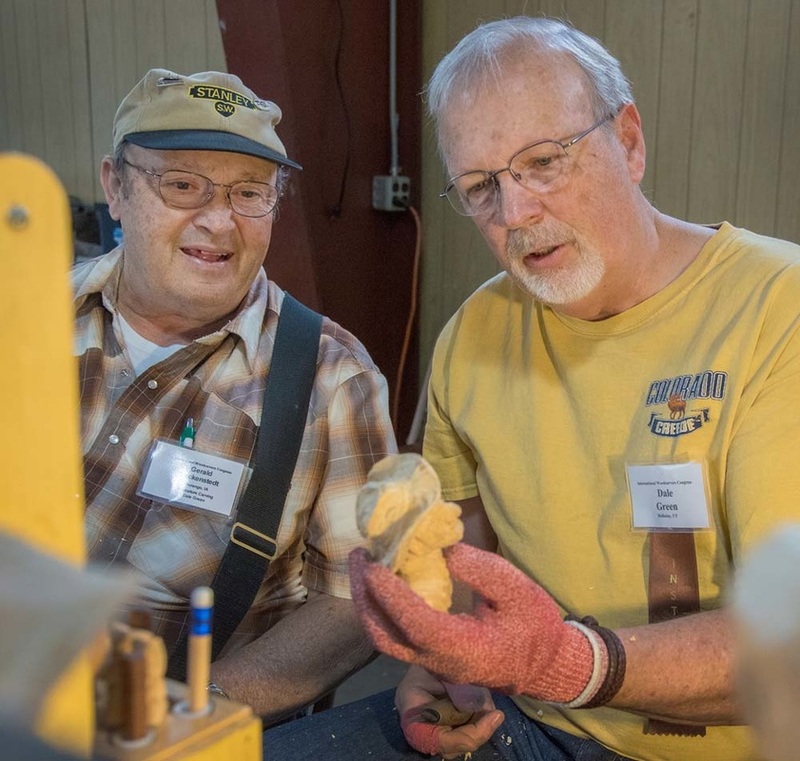 International Woodcarves Congress 2015 Classes, Vic Hood - Carving a Bust in Butternut. 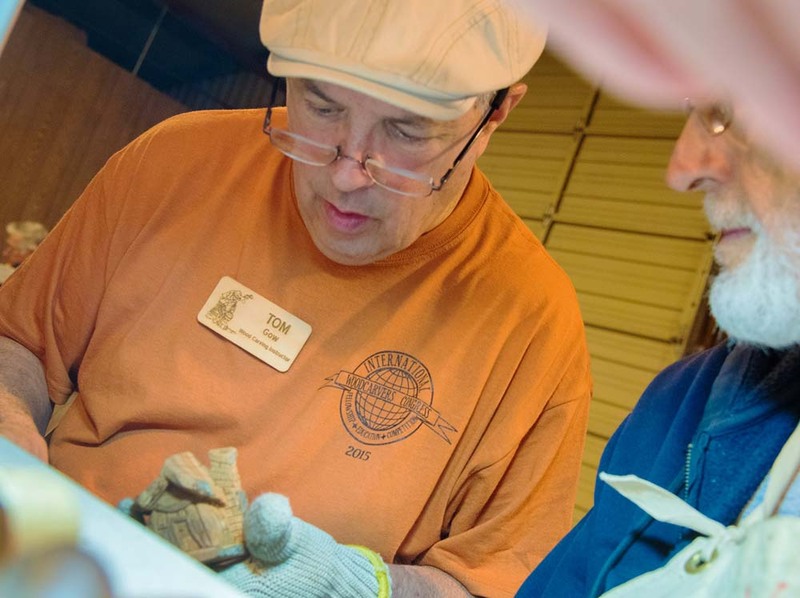 Vic helping Robert Zenoble. 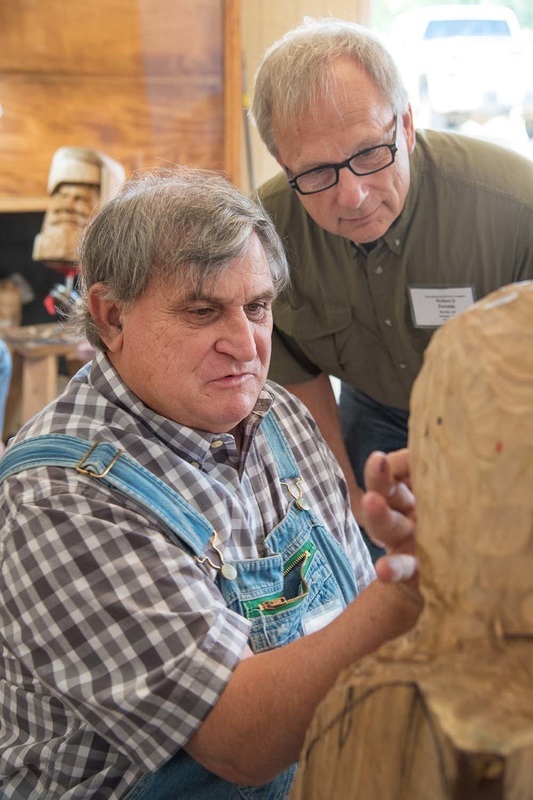 International Woodcarves Congress 2015 Classes - Vic Hood, Carving a Bust in Butternut. Vic making a point with Robert Zenoble. 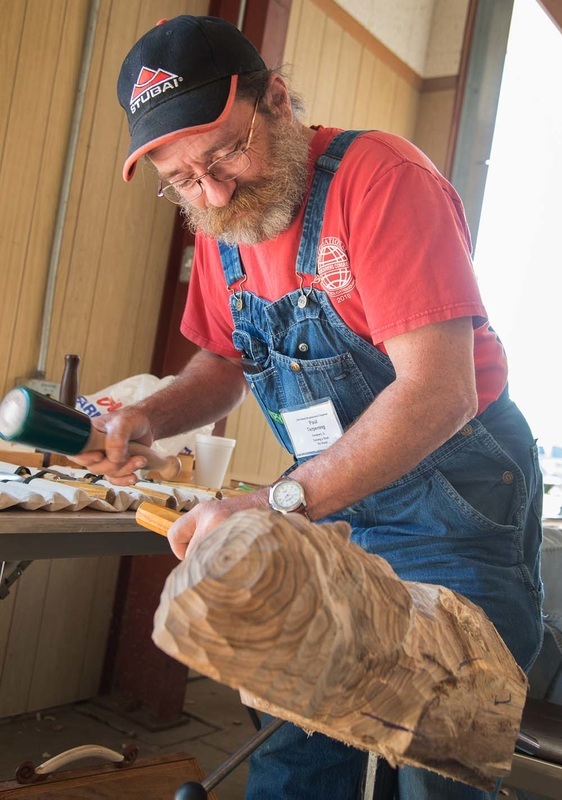 International Woodcarves Congress 2015 Classes -Terry Brasher, Carving Woodspirits in Unusual Woods. Terry shares a laugh with Jim Spencer. 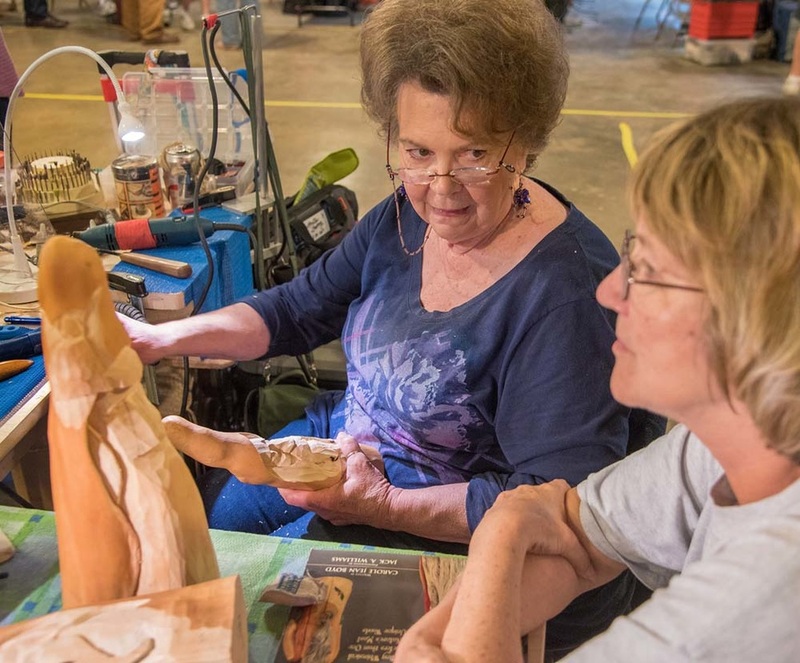 International Woodcarves Congress 2015 Classes - Terry Brasher, Carving Woodspirits in Unusual Woods. 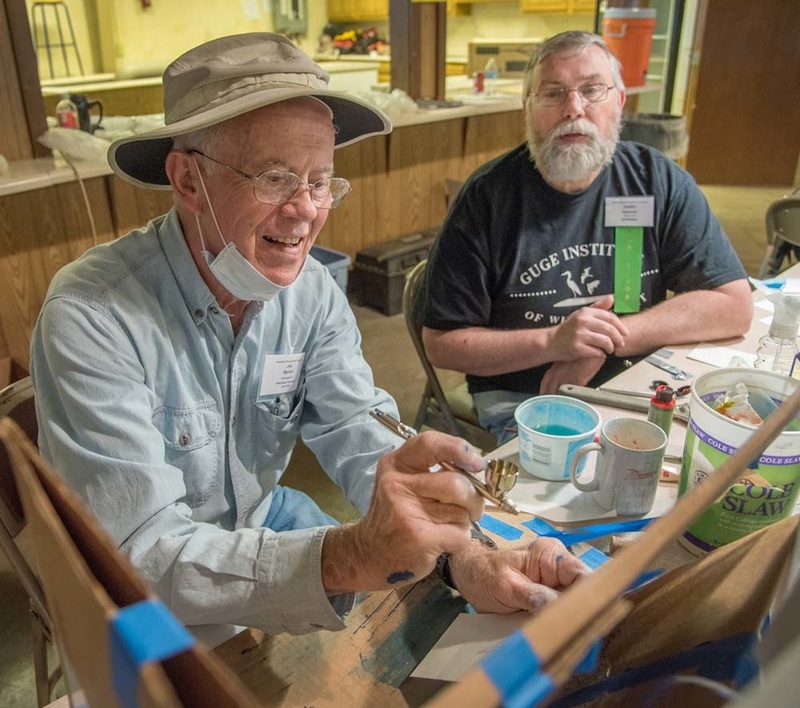 Terry working with Jim Spencer. 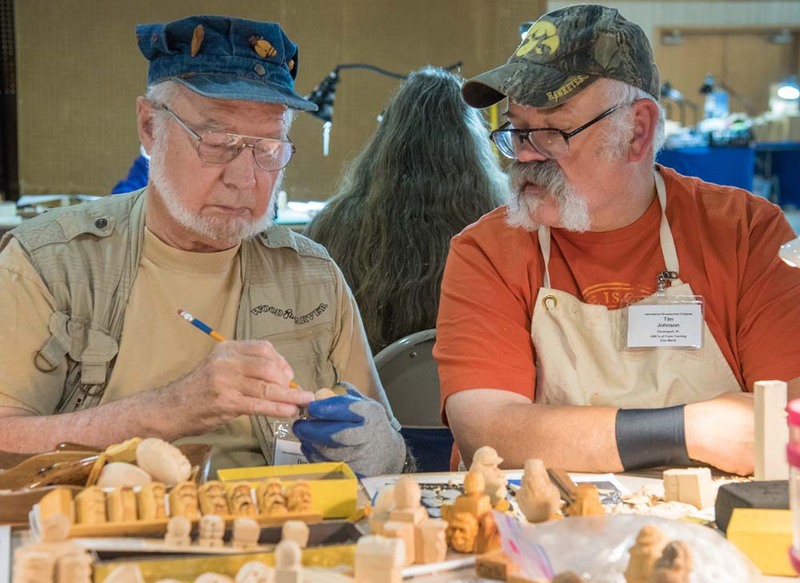 International Woodcarves Congress 2015 Classes - Neil Cox - Relief Carving of a Fur Trader. 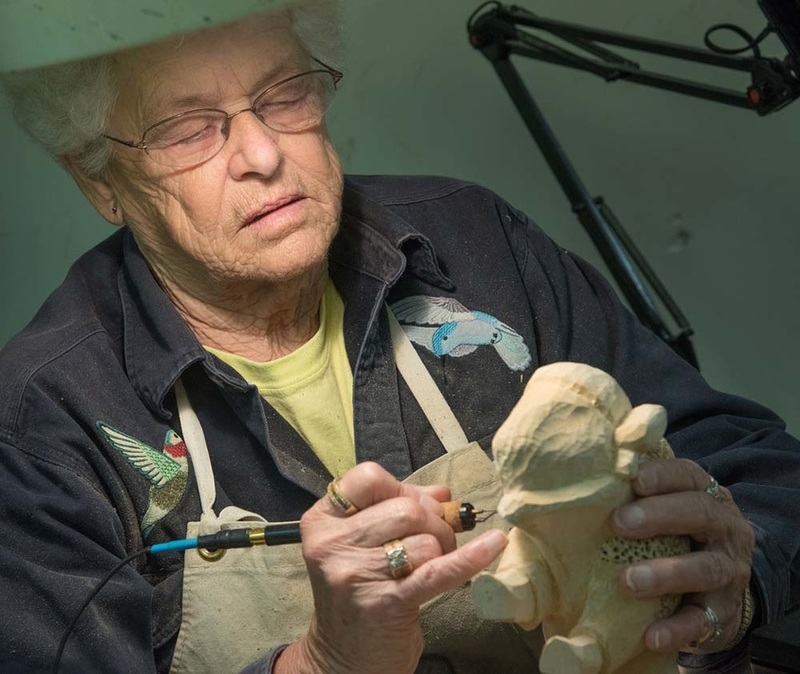 International Woodcarves Congress 2015 Classes - Leah Goddard, Realistic Animal Carving. 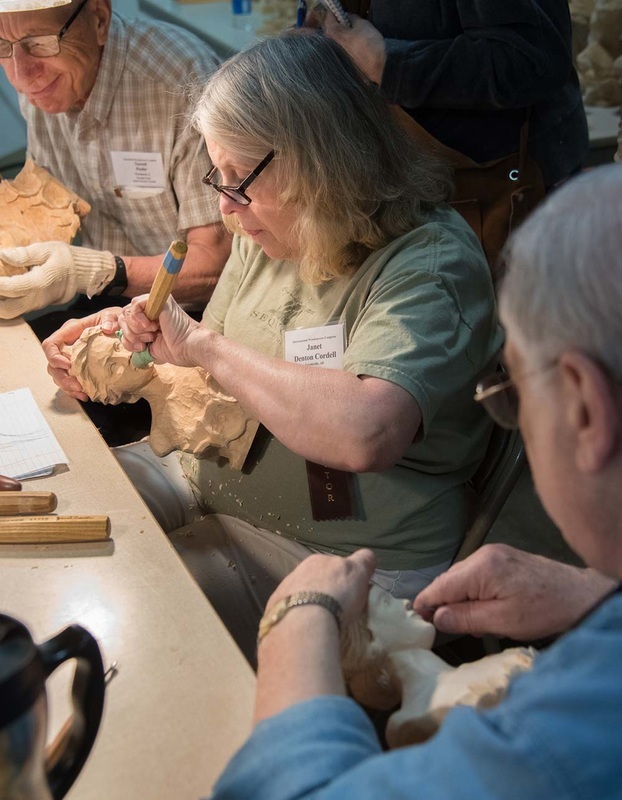 International Woodcarves Congress 2015 Classes - Carole Jean Boyd, Carving Cypress Knees. 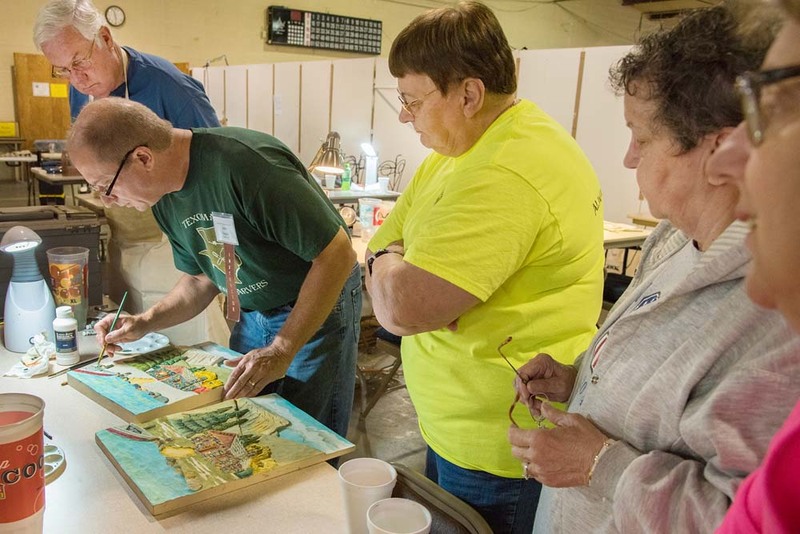 International Woodcarves Congress 2015 Classes - John Engler, Relief Carving and Painting. 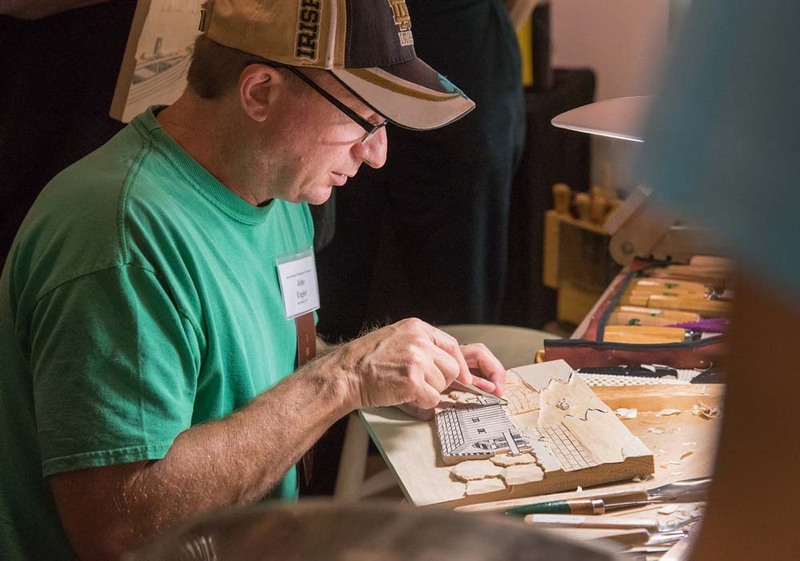 International Woodcarves Congress 2015 Classes - Don Mertz, The ABCÕs of Face Carving With a Knife. 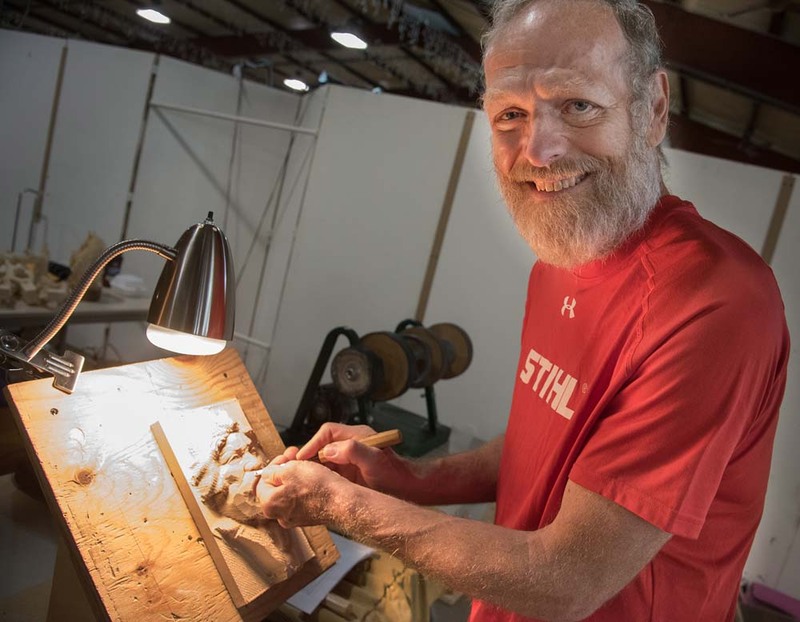 Tim Johnson brought a chain saw carved turtle to show and tell on Friday. 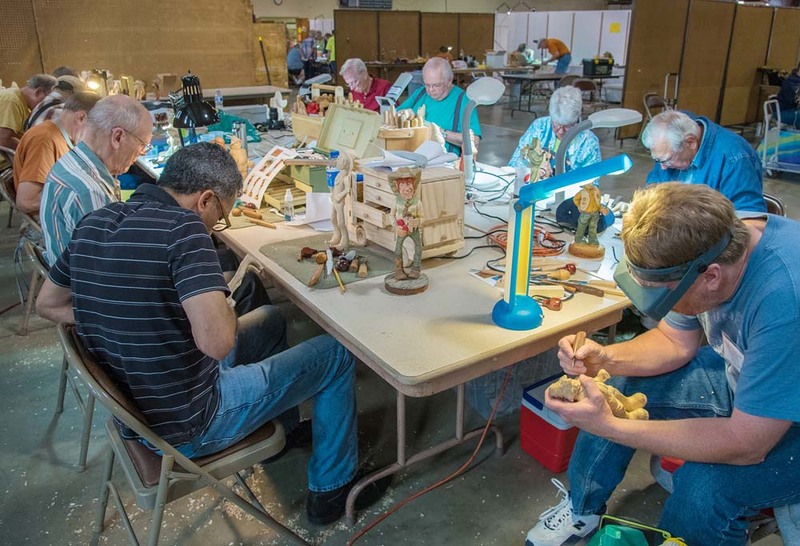 International Woodcarves Congress 2015 Classes - Dale Green, Caricature Carving. 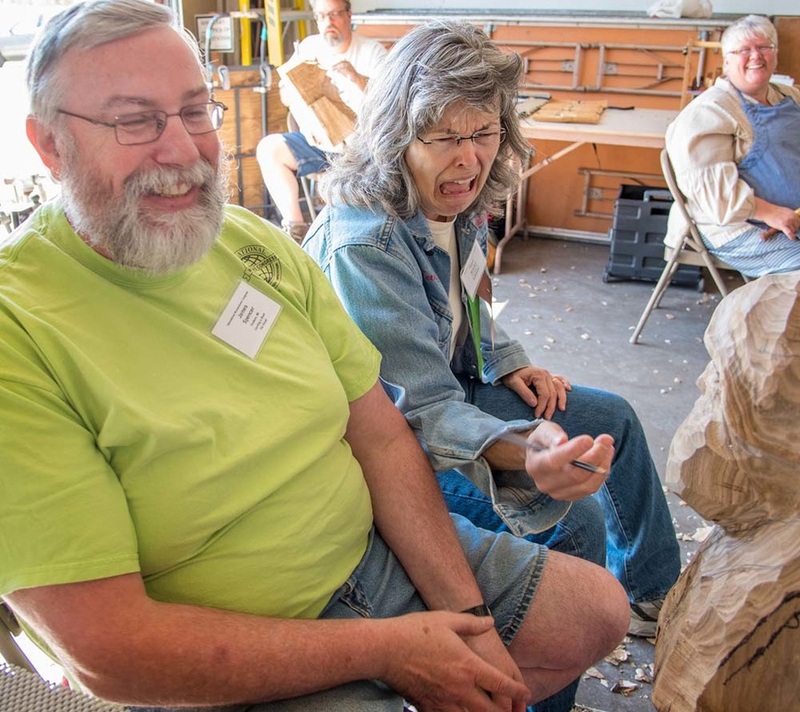 International Woodcarves Congress 2015 Classes - Dale Green, Caricature Carving. 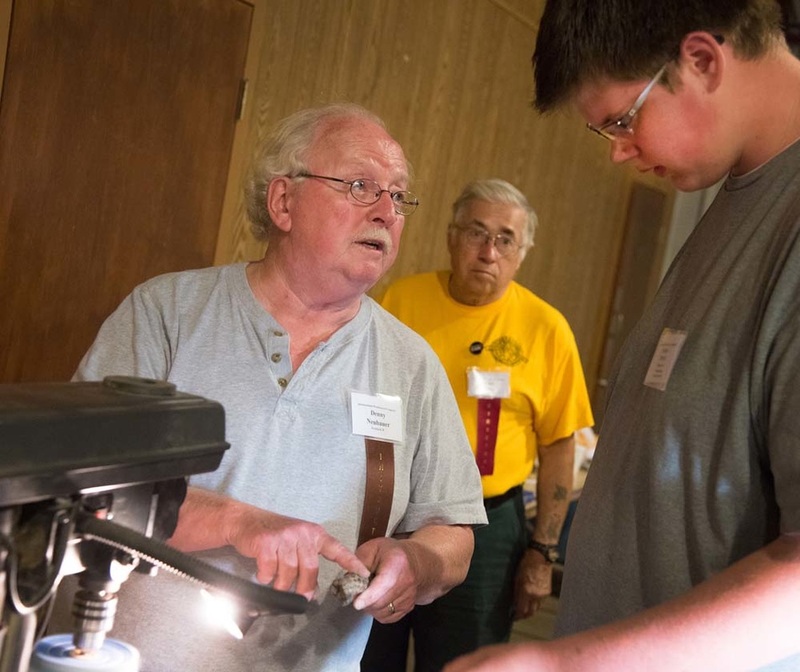 Dale with Gerald Bockenstedt (plaid shirt). 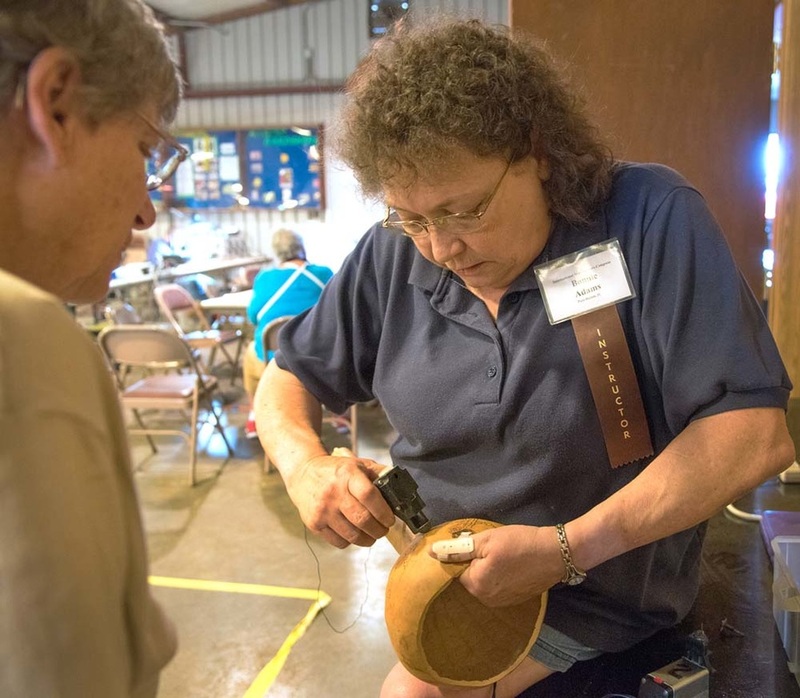 International Woodcarves Congress 2015 Classes - Tom Gow, Cottonwood Bark Carving. Tom works with Leonard Mumm. 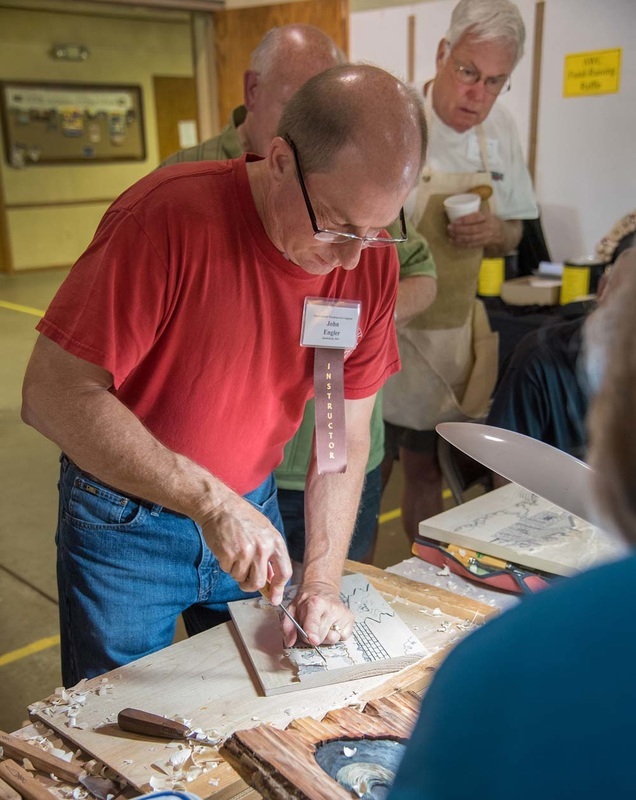 International Woodcarves Congress 2015 Classes - Denny Neubauer, Knife Making. 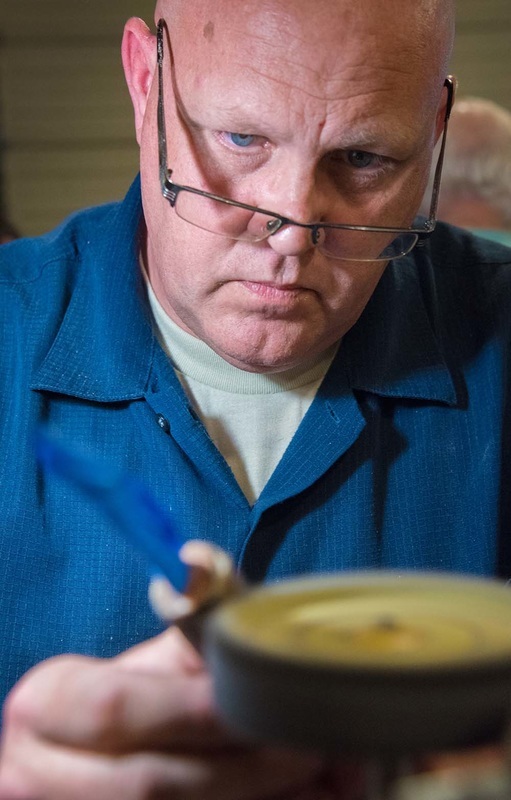 Eric Smyth sharpening his new knife. 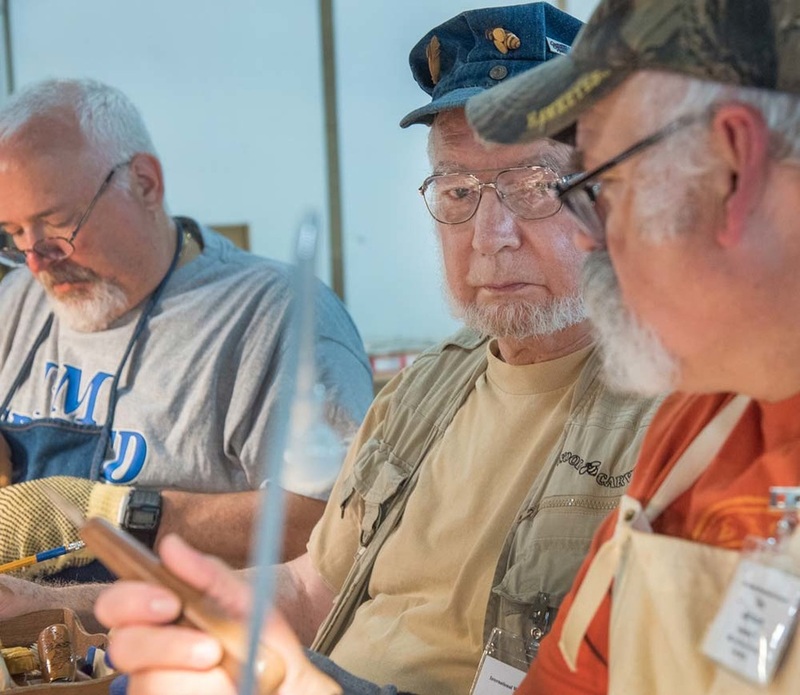 International Woodcarves Congress 2015 Classes - Denny Neubauer, Knife Making. Denny with Austin Smyth. 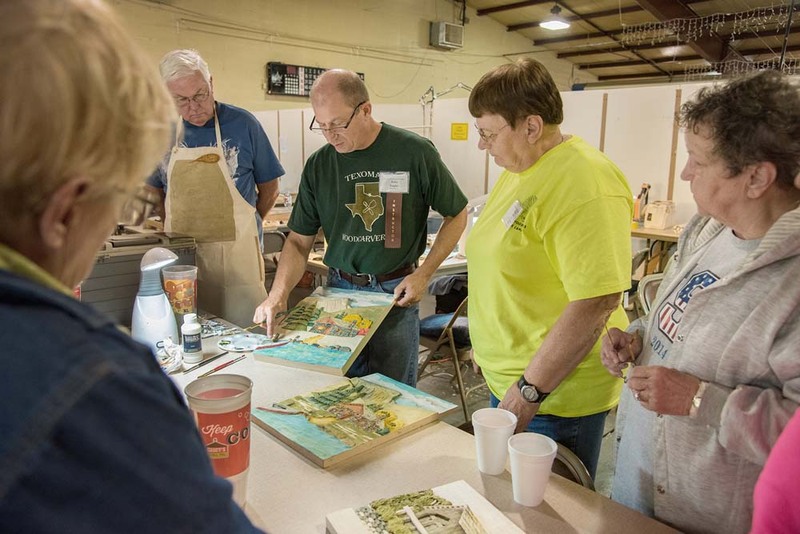 International Woodcarves Congress 2015 Classes - Josh Guge, Saturday morning short course on air brushing. 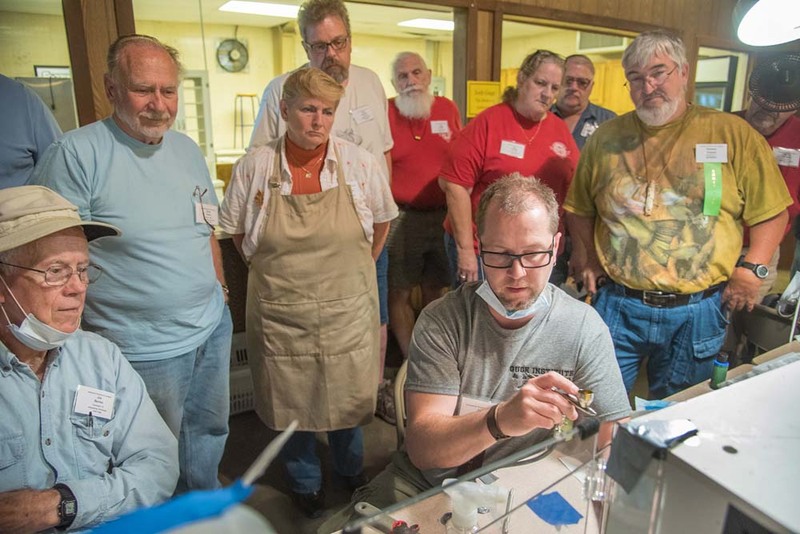 International Woodcarves Congress 2015 Classes - Josh Guge, Saturday morning short course on air brushing. Joe Barron, (with hat) and Jim Spencer. 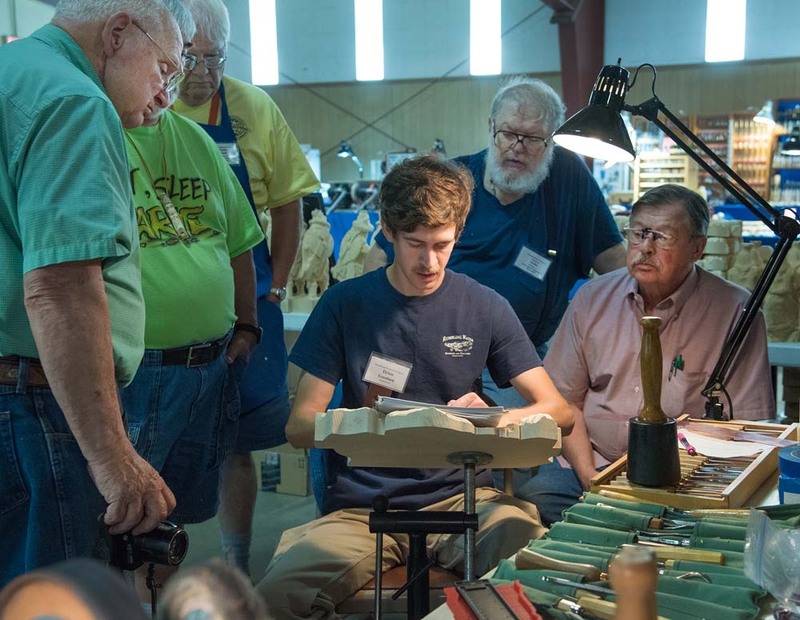 International Woodcarves Congress 2015 Classes - Denny Neubauer, Knife Making. 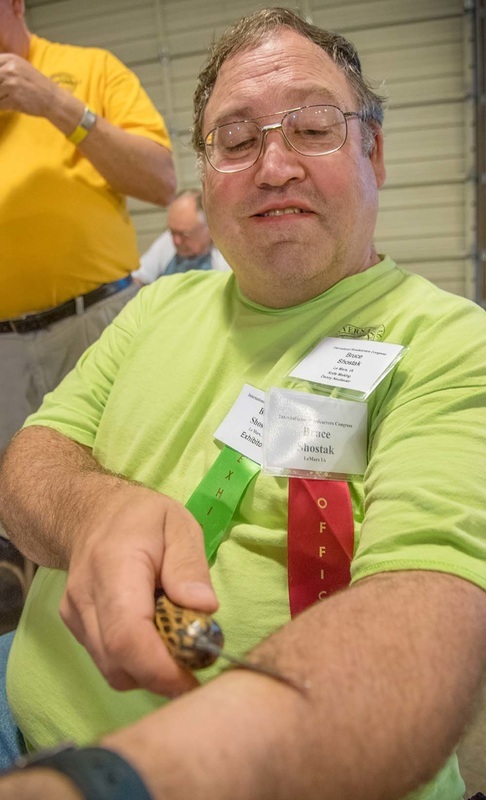 Bruce Shostak shows how sharp his new knife is by shaving some hair from his arm. 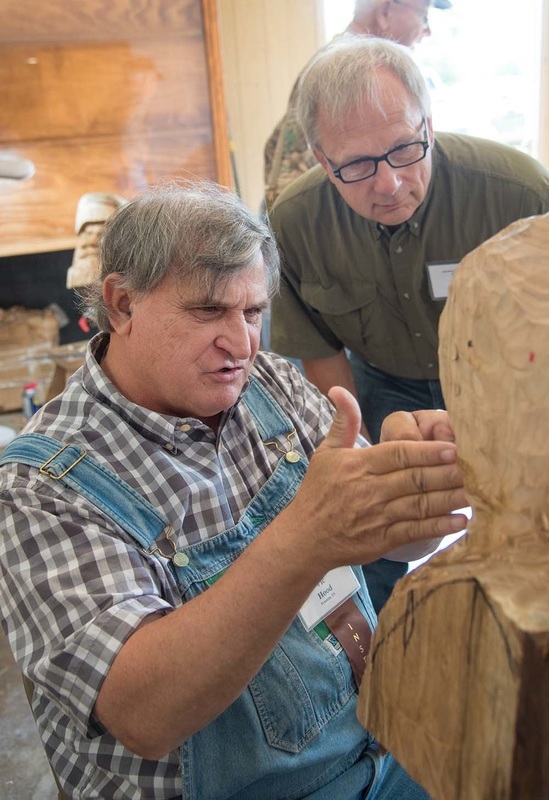 International Woodcarves Congress 2015 Classes - Dylan Goodson, Realistic Human Figures or Relief Scenes. Pat Boleman gets some help from Dylan. 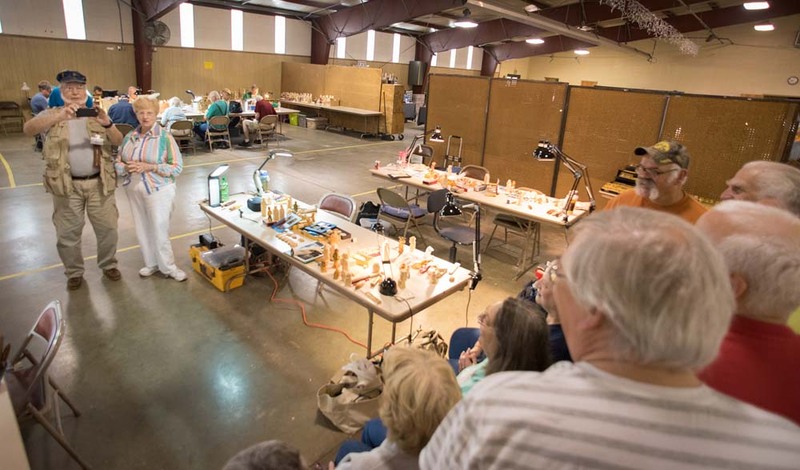 nternational Woodcarves Congress 2015 Classes - Dylan Goodson, Realistic Human Figures or Relief Scenes. Pat Boleman gets some help from Dylan. 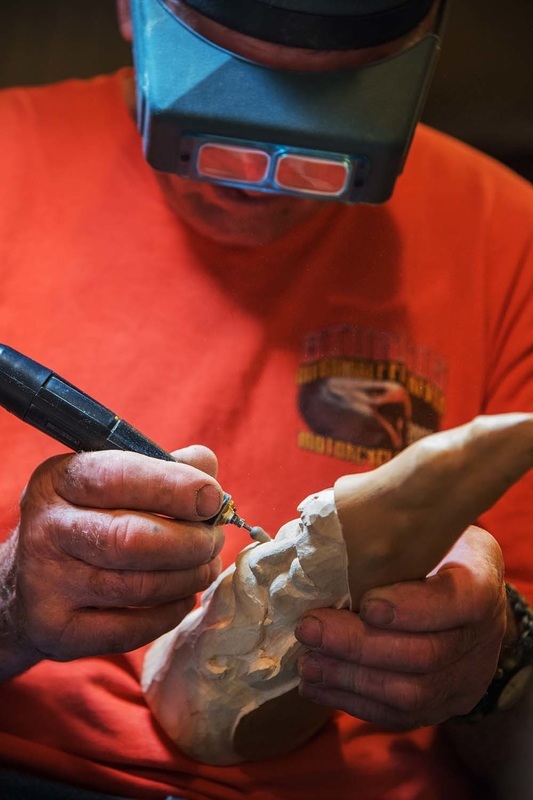 International Woodcarves Congress 2015 Classes - Leah Goddard, Realistic Animal Carving. Natalie Miles at work. 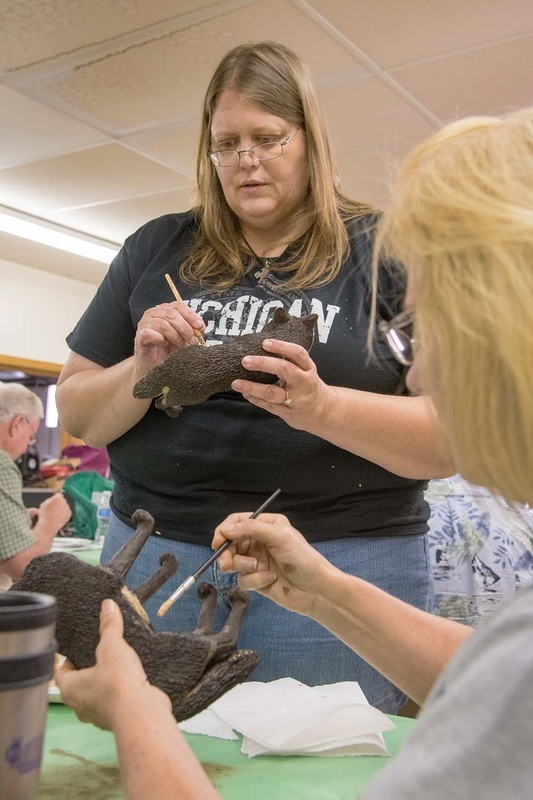 International Woodcarves Congress 2015 Classes - Leah Goddard, Realistic Animal Carving. 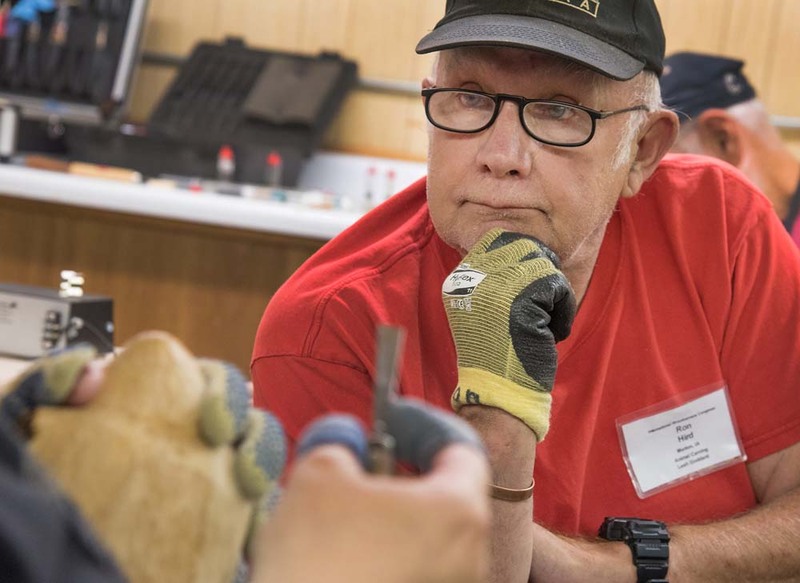 Ron Hird watching a demonstration. 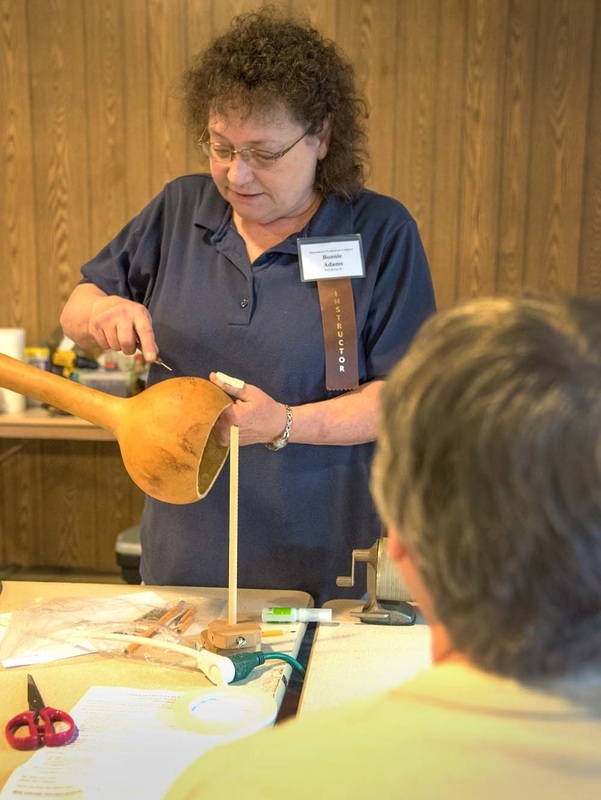 International Woodcarves Congress 2015 Classes - Leah Goddard, Realistic Animal Carving. 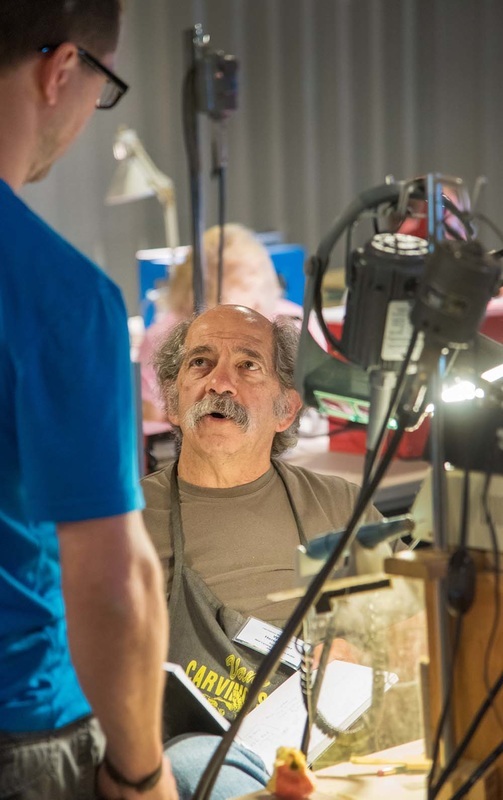 Jerry Schierholz at work. 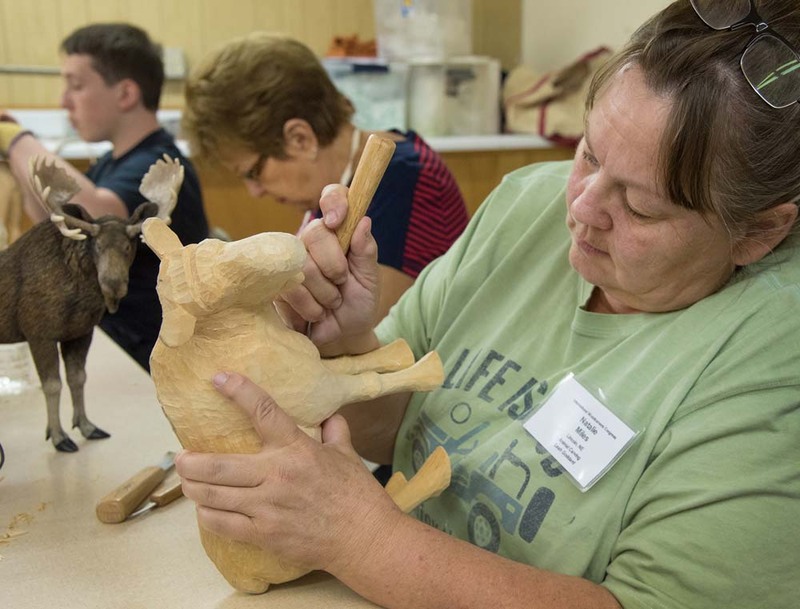 International Woodcarves Congress 2015 Classes - Leah Goddard, Realistic Animal Carving. Jan Faulkner burns in hair on her buffalo. 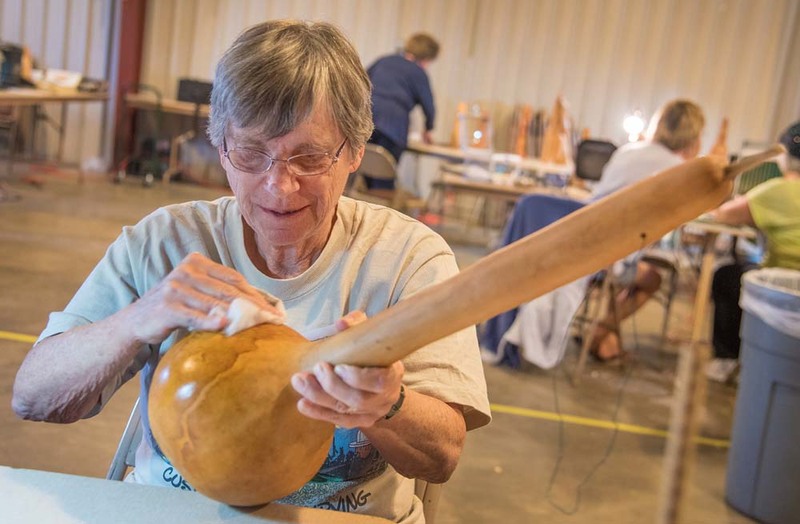 International Woodcarves Congress 2015 Classes - Bonnie Adams, Thunder Drum Gourd and student Irene Mumm. 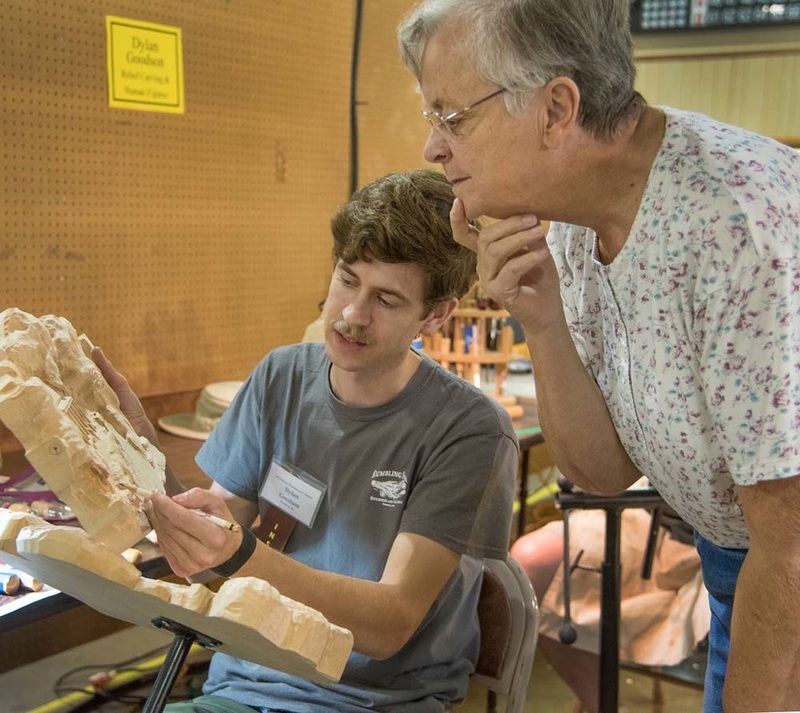 International Woodcarves Congress 2015 Classes - Dylan Goodson, Realistic Human Figures or Relief Scenes. 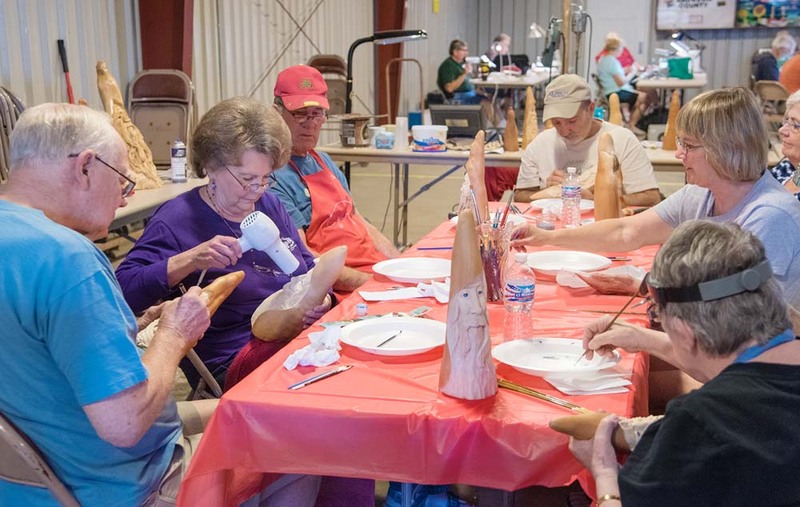 International Woodcarves Congress 2015 Classes - Don Mertz, The ABCÕs of Face Carving With a Knife. Don working with Tim Johnson. 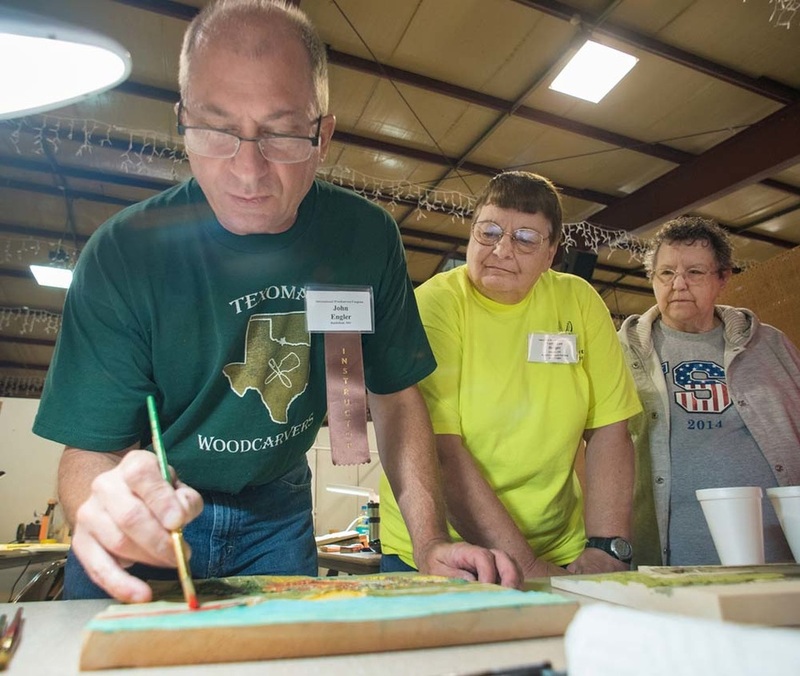 International Woodcarves Congress 2015 Classes - Tom Gow, Cottonwood Bark Carving. Tom with Doris Moody. 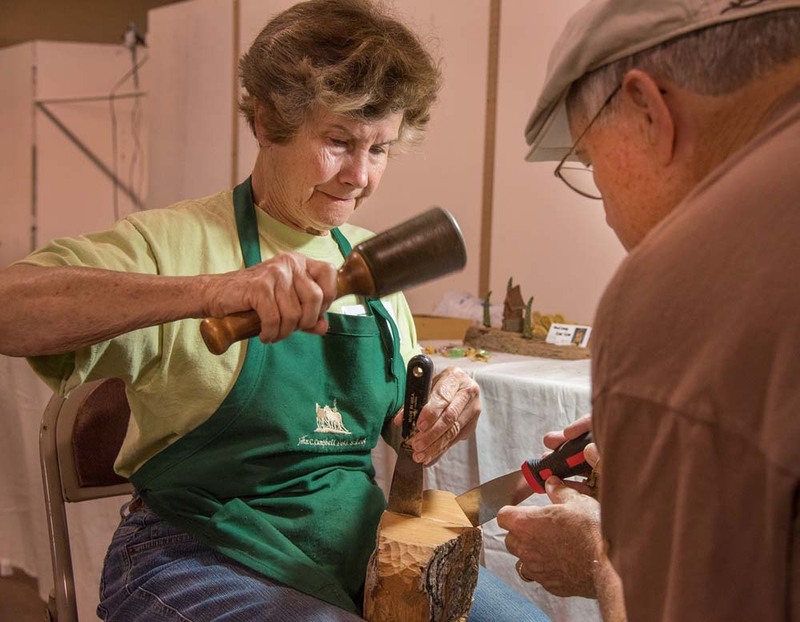 International Woodcarves Congress 2015 Classes - Carole Jean Boyd, Carving Cypress Knees. Carol Jean advises Jan Gramm. 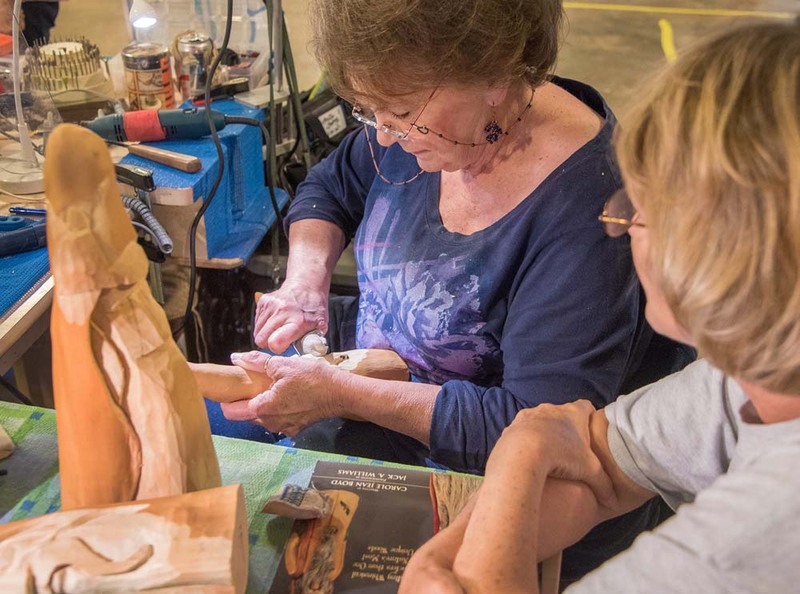 International Woodcarves Congress 2015 Classes - Carole Jean Boyd, Carving Cypress Knees. 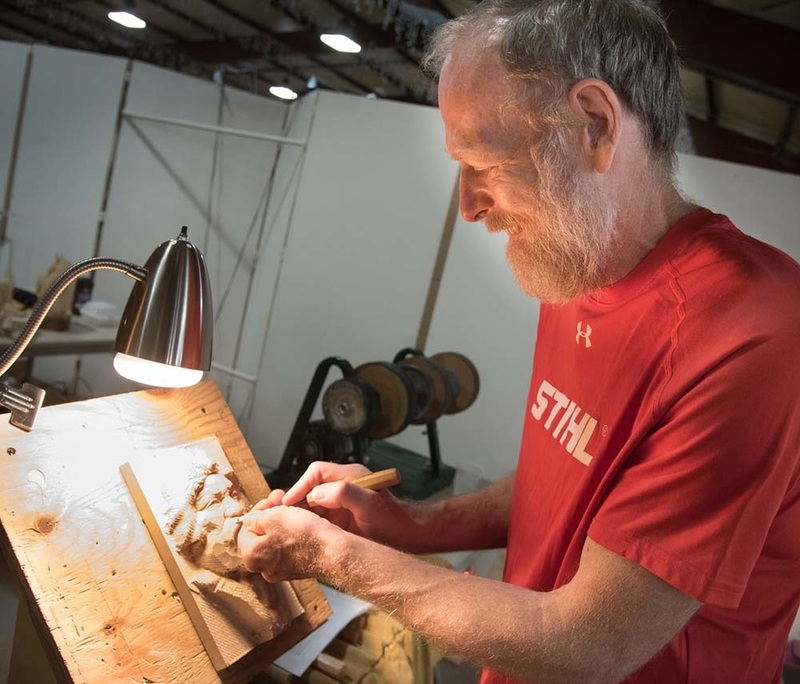 Pete Swanson power carves his Santa while wearing full gear. 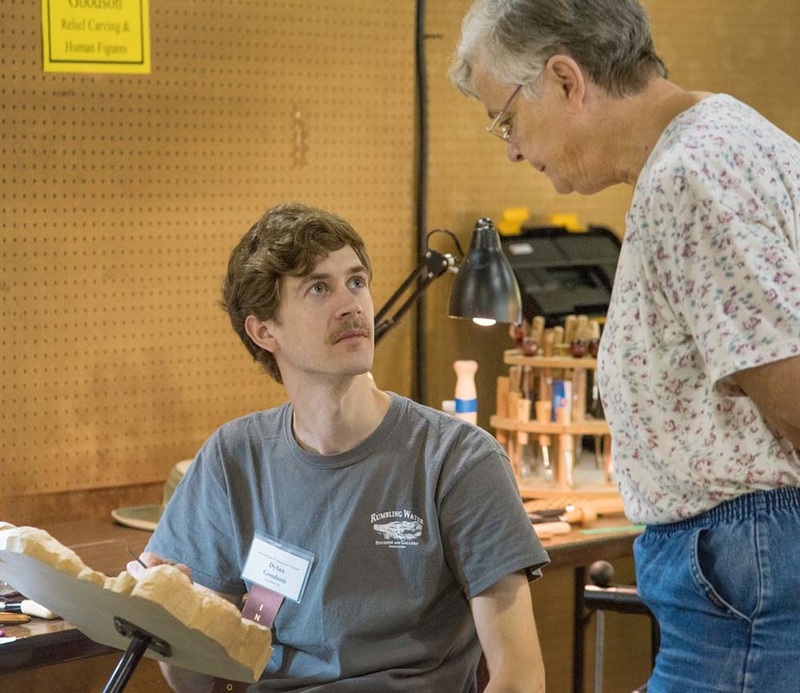 International Woodcarves Congress 2015 Classes - Josh Guge, Realistic Bird Carving, American Robin. Josh chatting with Whitey Hershberger.